A well-designed open plan kitchen will expand your living space, possess efficiency and offer a sense of flow and openness in a home. In recent years it has become a popular choice as people have come to embrace a less formal and more sociable home life. But a great open plan kitchen needs careful planning to be truly successful. The essentially functional role of a kitchen needs to be considered first and foremost. As in any kitchen, the working triangle between the sink, fridge and cooker need to be prioritised. Then, there needs to be both adequate storage and the sense of an open, smooth transition into the relaxing living areas. The entire space also needs to have a cohesive decor and inclusive layout if you're to take full advantage of the social benefits of this approach. 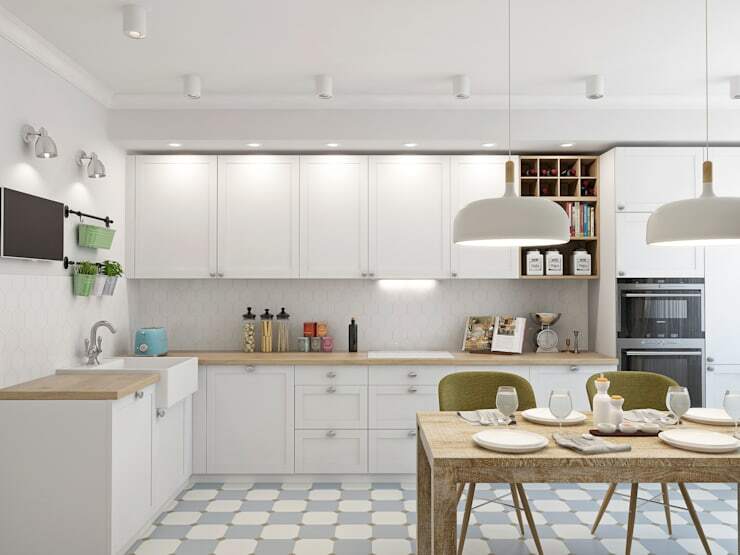 Here at homify we have collected a few key tips and illustrated them with some beautiful open plan kitchen designs. Keep reading to learn more. Before you can start planning your open plan kitchen, make a note of the location of plumbing and electrical outlets. These can be expensive to move and it's often a good idea to work around them. Then make a list of the smaller spaces or zones needed within the larger space. Perhaps you want a dining area, a breakfast nook or a kitchen island. Work out how much space needed for each element and add a minimum 1.5 meters traffic zone. It's important to think about the relationships between each zone, such as the flow between the cooking area and the serving areas. A kitchen island or some other preparation area that helps the cook face the living area is often a good way to create a cohesive social layout. Tip: consider a room divider as seen here, for those days when you need a little privacy to concentrate. A single, continuous floor finish and material has a great effect in enlarging the sense of space and connectivity in an open plan layout. This is particularly important in a small home. This brings up the issue of choosing a finish that works well in both areas. A living room with porcelain tiles is a popular choice but we feel this often looks cold and uninviting. A slate floor is a good compromise and a wooden floor really ticks all the boxes. For those who just feel like ignoring that advice, look at this lovely porcelain floor tile by Lavradio Design. 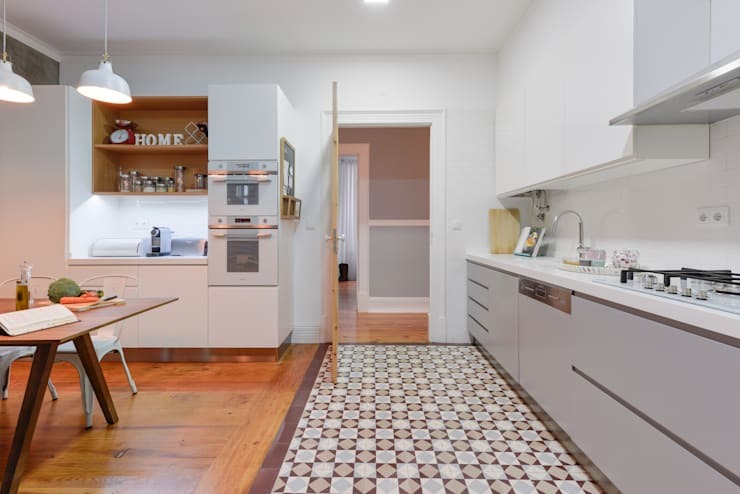 Although there are two radically different patterns going on here, the warm colours of the tile work well with the golden wooden floor. The other essential factor in the cohesive look is the perfectly level transition point where the two are butted up against each other. When a large area with multiple zones is visible from lots of angles, it's important to have colours that work together well. While white is a great base, it's fine to use shades or tints of the same colour. If you are starting a home from scratch, you may feel tempted to be more adventurous with your colour choices. But it's advised to keep your cabinets a neutral colour. Drastic choices are unlikely to age well. It's best to use a mute colour for large areas and reserve the colour statements for the splash-back or a cupboard door that can be easily replaced. Don't forget that small splashes of colour can be a great way to unify the various zones in the room. 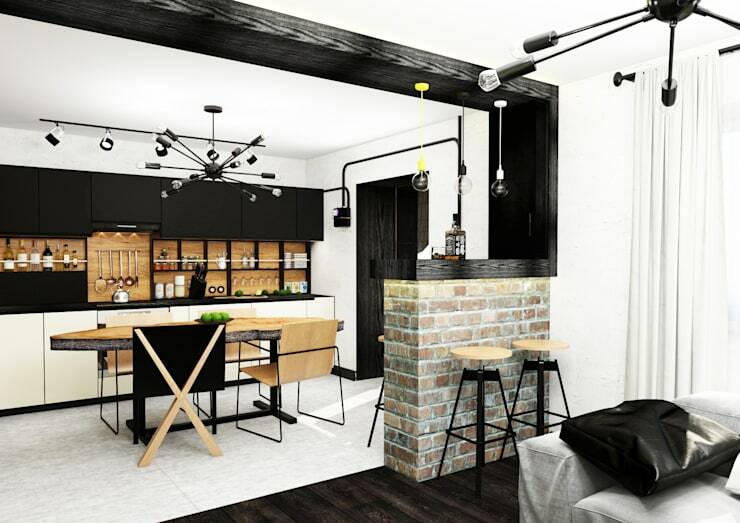 See how the alternative use of black and white in this kitchen by ABC Design has been used to hold the two areas together. Good lighting sets the atmosphere of a living space. But it's also the key to making the most of your space in a functional sense. 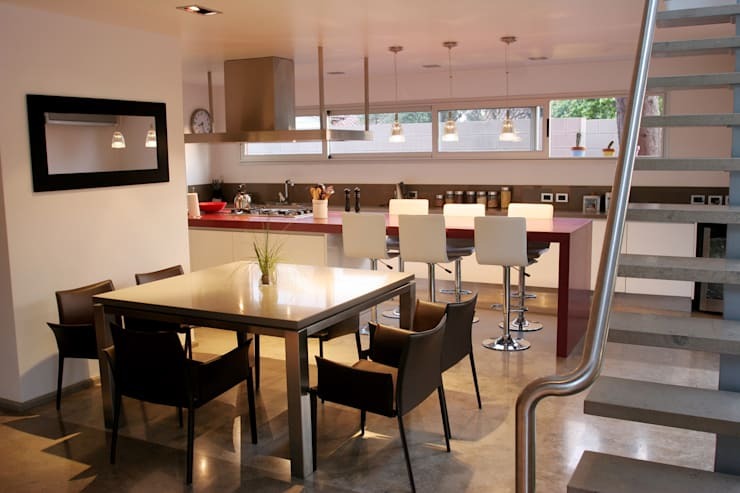 An open plan kitchen will have several different lighting needs. Lighting within drawers and cupboards has become popular lately. But aside from this trend, the essentials are LED spotlights for general illumination and strip or task lights under the kitchen cupboards. To finish off the effect, a main lamp-light will add layer and texture to your lighting. 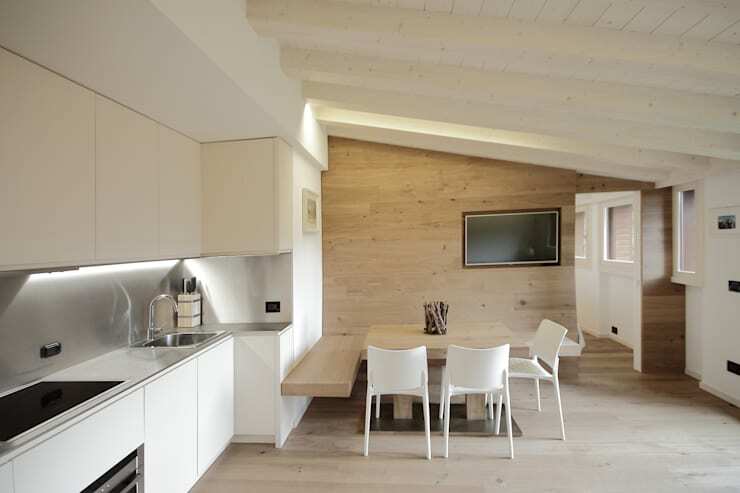 But don't forget that your lighting plan can also help define zones within your open plan. One great way example is the popular choice of feature drop-lights over a dining table as seen here. Upper kitchen cabinets are often removed at the transition point between an open plan kitchen and living room. This helps of course to maintain the visual flow that's so important in open plan areas. But of course this means less storage space. One good solution is to choose a kitchen island or breakfast bar with storage underneath as seen here. Many open plan layouts still have some kind of built-in transition point like a low wall or glass partition as shown in this kitchen. This area is a good opportunity to build in cupboards particularly around the doorways. Don't forget to look at the different depths and inner compartments that will help maximise every inch of space. 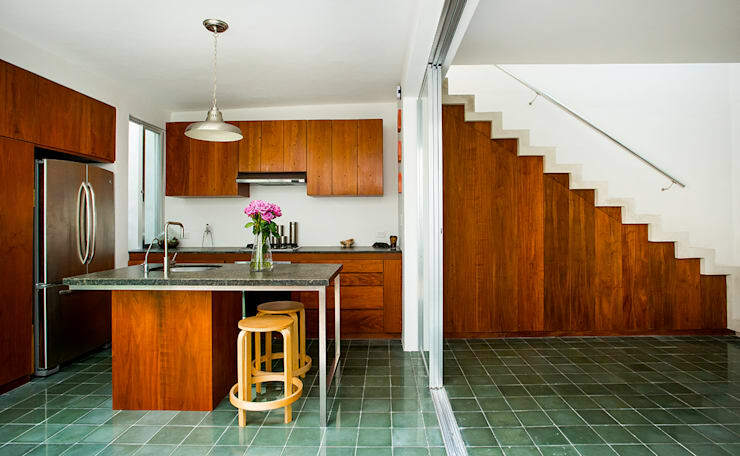 An open plan layout runs the danger of being a little too busy in a visual sense. To minimise the clutter, cut down on the small objects on display and utilise that extra storage. Kitchen benches and worktops are an obvious magnet for clutter and the general advice is to keep no more than three objects on your worktop. This may seem a little extreme, but it's entirely possible if you build in storage options that are close to hand. For one final burst of inspiration, have a look at the Zen-like simplicity in this Japanese open plan kitchen. 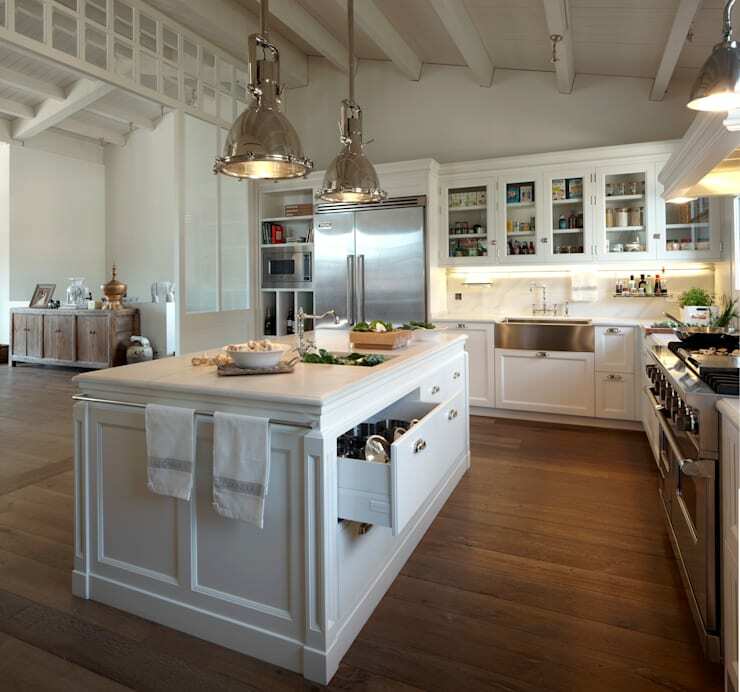 If you are interested in kitchen design, you'll love this Ideabook Kitchen island inspiration. What do you like about these open plan kitchen ideas? We'd love to hear in the comments below.